Kate is from Wrentham, MA. She is a graduate from the Doctorate of Physical Therapy program at Northeastern University, after receiving her B.S.in Rehabilitation Science from Northeastern. She enjoys working with a wide variety of patient populations including both pediatrics and geriatrics. 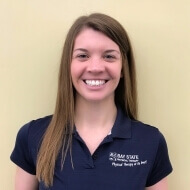 She is also a Certified Strength and Conditioning Specialist and enjoys working in sports medicine and injury prevention. At the YMCA, Kate is involved in the Live Strong program andparticipates in staff education. She also enjoys volunteering at local races, including the Pan-Mass Challenge and FIT Challenges. Kate enjoys running and is a Boston and Chicago marathon finisher. She also enjoys kickboxing, weightlifting, and playing basketball.